Over the past number of years, Care for Cambodia has been developing a village outreach program. 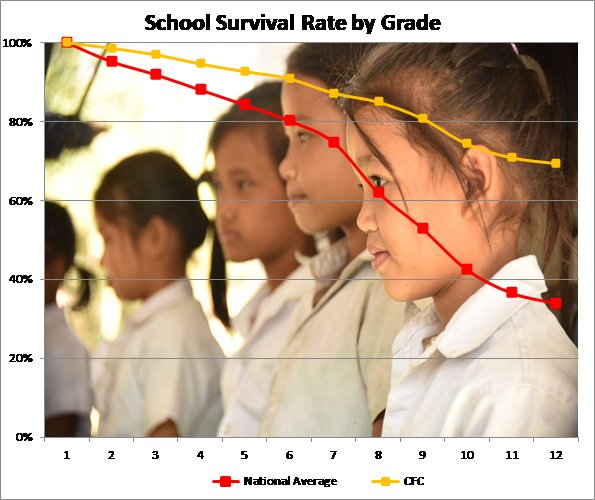 This is a project designed to promote education in rural Cambodia. Care for Cambodia identifies villages that require assistance. They establish a relationship with the village leader and appoint individuals within the community who can assist children with their schooling. The leader and teaching assistant will be given regular teaching and training by Care for Cambodia staff in the headquarters in Phnom Penh. Children in these villages will receive support through a project called Edukid (see website: www.edukid.org.uk). In recent years another organisation called Heaven’s Family (see website: www.heavensfamily.org) has partnered with Care for Cambodia following the Edukid model. Edukid provides each child with a school pack. This includes a school uniform and educational accessories. State education in Cambodia is free, but often the cost of equipment is prohibitive for families. Around 3,500 children, aged 5 to 16, receive daily supplementary education in our village projects. The children come from poor families for whom lack of finance is a significant barrier to the education of their children. Our program assists children by providing additional classes that supplement the government education that they receive. Classes in English, Khmer, Mathematics, Health & Hygiene and Child Protection are offered. One goal is to keep kids in school for longer, enabling them to receive a fuller education. Data from the academic year 2017/18 shows that we are being successful in the pursuit of this goal. Children don’t stay children for long. They quickly grow up and require help and support in different ways. The Youth Project helps young people as they transition from childhood to adulthood. Each youth project brings local young people together for sport, life skills training, community volunteer work and English classes. Exceptional and hard-working young people can apply for one of our skills or university scholarships. In 2018 we have 22 youth receiving scholarships to study a variety of subjects including Accounting, English, Medicine, Civil Engineering, Mechanical Engineering & Tourism. The Family Project provides training in a variety of disciplines that aim towards community development and empowerment: for example, agricultural techniques and parenting skills. Care for Cambodia also assists families in developing small businesses through the establishment of community savings schemes. Farmers, taxi drivers and small shop owners have been given a ‘foot up’ through this scheme. 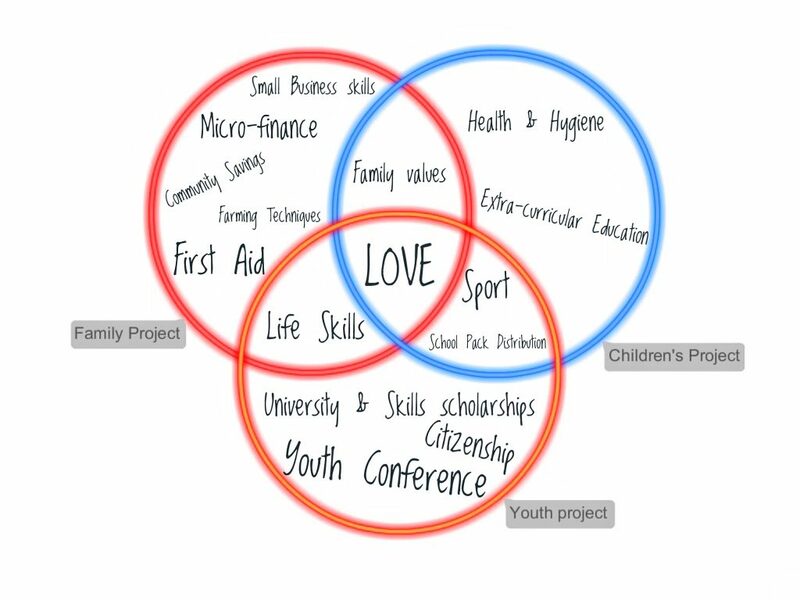 The Venn diagram below illustrates how the three projects work together with love at the center of all we do.